What is the Disaster Response Registry? When national emergencies or disasters such as floods and hurricanes occur, supplies and services need to be procured and rushed to the affected area quickly. To expedite this process, the System for Award Management (SAM) contains a Disaster Response Registry in accordance with FAR Subpart 4.11 and FAR Subpart 26.2 listing those contractors who are willing to provide debris removal, distribution of supplies, reconstruction, and other disaster or emergency relief supplies and/ or services. How do I search the Disaster Response Registry? A list of prospective vendors voluntarily participating in the Disaster Response Registry can be retrieved using the System for Award Management (SAM) search tool by going to SAM > Search Records and selecting the Disaster Response Registry Search link. 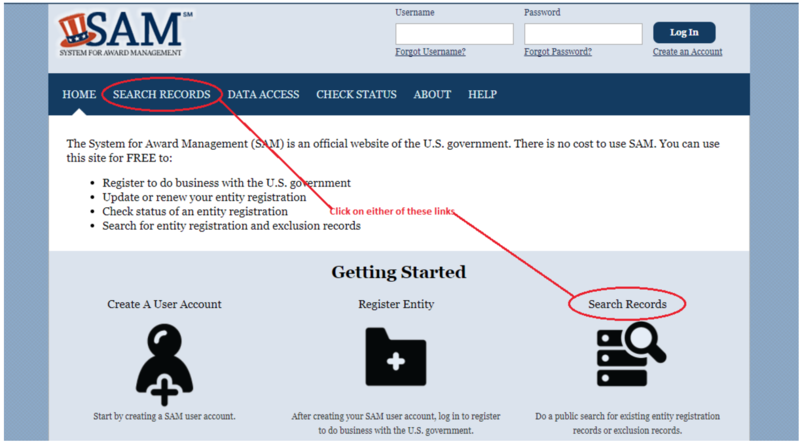 You can find a Quick Start Guide for Disaster Response Registry Search posted at SAM.gov > Help > User Guides > Quick User Guides. How do I add my company to the Disaster Response Registry? Your entity must be fully registered in the System for Award Management (SAM) at https://www.sam.gov for federal contracts and other procurement opportunities in accordance with FAR Subpart 4.11 System for Award Management, to be included in the Disaster Response Registry. On average, it takes 2-3 days to properly register and have your registration become active in SAM. It may take longer. During the registration process, you must indicate you want to participate in the Disaster Response Registry and provide the required information on the Disaster Response Information page within the Assertions module. Once your registration is active, you will be added to the Disaster Response Registry and contracting officers will be able to locate your company through the Disaster Response Registry Search. How can I get help registering my entity in SAM? You can get FREE help with your registration by contacting our supporting Federal Service Desk (FSD). In addition, if you are located in the U.S. and its outlying areas, you can get FREE support from your local Procurement Technical Assistance Center (PTAC), an official resource for government contracting assistance. Check the PTAC website to locate your closest PTAC. 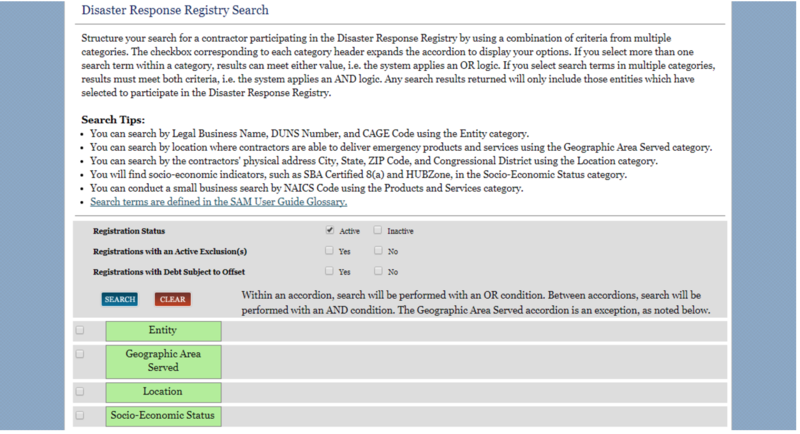 Do I need to pay to be added to the Disaster Response Registry in SAM? No. It is FREE to register and maintain your registration in SAM. If you get an email from any address that does not end in .gov or .mil, be cautious. If you get an email, text message, or phone call asking for money or payment of any amount, be very cautious. These parties do not represent the U.S. government. You engage third party vendors at your own risk. 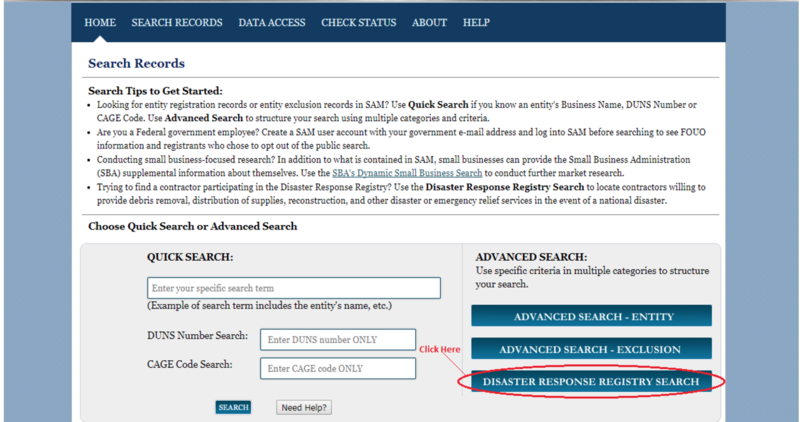 Step 4: You can now search the Disaster Response Registry. For additional instructions on how to use this tool please reference the Quick Start Guide for Disaster Response Registry.